By now, you have probably read our case for nutrient recycling and closing the consumption-production loop. 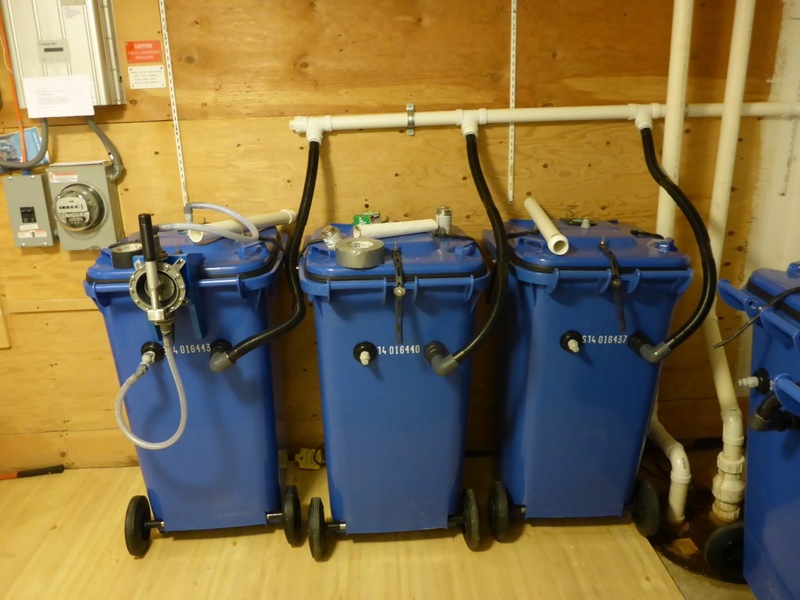 Perhaps you’ve read about the hybrid urine-diverting/composting system that we have developed and tested. This is where you can find out more in order to start recycling nutrients at home. Or you can read our suggestions for nutrient recycling on a local/regional scale. 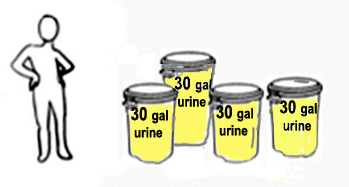 One American adult produces about 120 gallons of urine per year. Depending on what a person eats, the NPK (nitrogen, phosphorus, potassium) ratio varies, but is approximately 10:1:4. Urine contains many other minerals needed by plants as well. Although it is usually sterile, urine should be sanitized before use. This can be achieved by storing the urine for six months or by heating it to 176 °F for three minutes. 1) A liquid, often diluted with water to optimize uptake by plants. Gardeners typically dilute urine and water in a 1:5 ratio and apply it directly to the soil under plants (not on the plants). It can also be applied 1:1 to hay fields. The levels of N, P and K are well matched to the needs of grain crops as well. 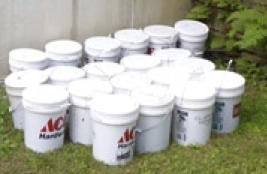 2) A moist mix, when urine is mixed with dry absorbent sawdust pellets and diatomaceous earth to produce a moist, odorless mixture that can be easily handled, stored and applied as a soil amendment. This moist mix can be used In seedling trays, in pots with seedlings, and when transplanting or seeding in the ground. The volume of compost produced by a person in one year from a Full Circle composting system is about 18 gallons of earth-like material. The amount may vary depending on the proportions of original material (feces, toilet paper, wood shavings, facial tissue, paper towels). Due to more complete decomposition and evaporation of moisture, the volume of compost in the bin, after a one-year retention time, is reduced by 50-80%. Further retention time will reduce the volume more. 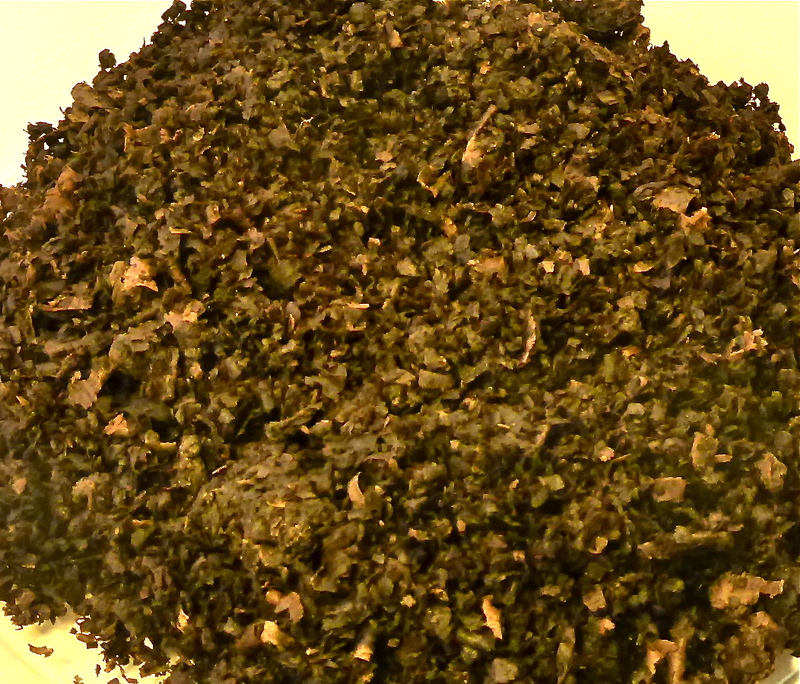 The finished compost material removed from the bin is slightly moist and looks like rich garden compost. The use of compost from composting toilets is regulated in some states because it might contain pathogens. 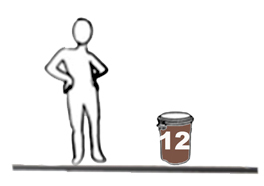 In order to use or dispose the compost, see our explanation of regulations in Massachusetts. In a nutshell, the compost must be buried on-site under six inches of clean, compacted soil, collected by a licensed septage hauler, or disposed of in another manner and location approved by the local Board of Health. Alternatively, compost can be legally applied to the surface of the soil after being re-composted at high temperature–a method originally developed for turning sewage sludge into Class A biosolids, which contain no detectible levels of pathogens and “…used in small quantities by general public have no buffer requirements, crop type, crop harvesting or site access restrictions.” (EPA). However, high-temperature composting is impractical for most homeowners and is likely unnecessary. Room-temperature composting is known to eliminate pathogens over time, but regulations have yet to be established to specify how long compost should be stored before being used in agriculture. Many states apply rules to composting toilets that were originally designed to regulate large-scale, centralized sewage sludge processing. Because humus from composting toilets is very different from sewage sludge, and because the scale of operation is so much smaller, these current legal requirements discourage beneficial use of the compost. This situation would be greatly improved by new rules tailored to composting toilets, specifying minimum composting times that were scientifically shown to eliminate pathogens, allowing safe reuse as fertilizer at the home-scale. Please read more about nutrient recycling on a local/regional scale.